Unable to create InnoDB tables. 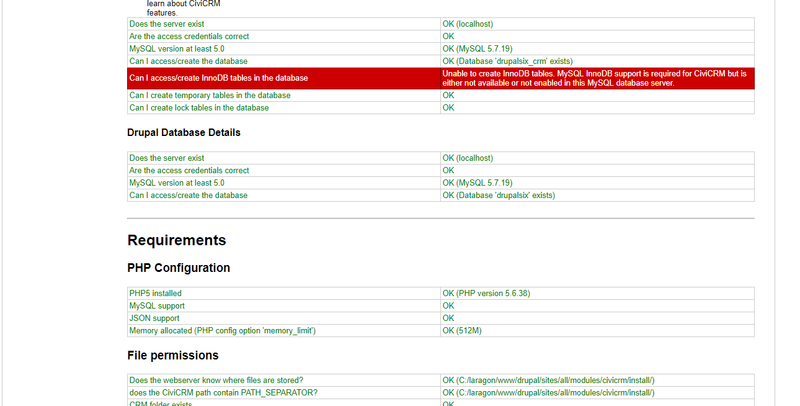 MySQL InnoDB support is required for CiviCRM but is either not available or not enabled in this MySQL database server. Everything else seems to be ok, I'm gettinig this error in a windows environment. First I tried with wamp, now I'm trying with Laragon. I tried also with vagrant and homestead which is a linux environment I think, same results. I tried setting innoDB as the default engine and a lot stuff that is there on internet, but anything seems to work. Any idea? Just go to civicrm/install/index.php and change the line with code if ( $dbName != 'Drupal' ) and either exclude the entire if statement (comment it out) or change it to if(true). Not the answer you're looking for? Browse other questions tagged drupal upgrade installation update migration or ask your own question.